Signaling for her companions to wait, a halfling creeps forward through the dungeon hall. She presses an ear to the door, then pulls out a set of tools and picks the lock in the blink of an eye. Then she disappears into the shadows as her fighter friend moves forward to kick the door open. A human lurks in the shadows of an alley while his accomplice prepares for her part in the ambush. When their target — a notorious slaver — passes the alleyway, the accomplice cries out, the slaver comes to investigate, and the assassin’s blade cuts his throat before he can make a sound. Suppressing a giggle, a gnome waggles her fingers and magically lifts the key ring from the guard’s belt. In a moment, the keys are in her hand, the cell door is open, and she and her companions are free to make their escape. Rogues rely on skill, stealth, and their foes’ vulnerabilities to get the upper hand in any situation. They have a knack for finding the solution to just about any problem, demonstrating a resourcefulness and versatility that is the cornerstone of any successful adventuring party. Rogues devote as much effort to mastering the use of a variety of skills as they do to perfecting their combat abilities, giving them a broad expertise that few other characters can match. 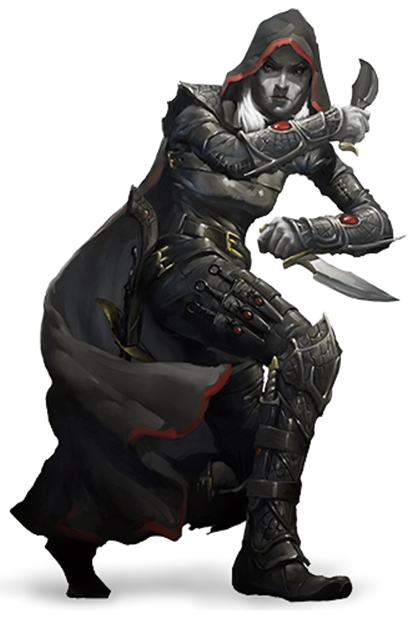 Many rogues focus on stealth and deception, while others refine the skills that help them in a dungeon environment, such as climbing, finding and disarming traps, and opening locks. When it comes to combat, rogues prioritize cunning over brute strength. A rogue would rather make one precise strike, placing it exactly where the attack will hurt the target most, than wear an opponent down with a barrage of attacks. Rogues have an almost supernatural knack for avoiding danger, and a few learn magical tricks to supplement their other abilities. Every town and city has its share of rogues. Most of them live up to the worst stereotypes of the class, making a living as burglars, assassins, cutpurses, and con artists. Often, these scoundrels are organized into thieves’ guilds or crime families. Plenty of rogues operate independently, but even they sometimes recruit apprentices to help them in their scams and heists. A few rogues make an honest living as locksmiths, investigators, or exterminators, which can be a dangerous job in a world where dire rats—and wererats—haunt the sewers. As adventurers, rogues fall on both sides of the law. Some are hardened criminals who decide to seek their fortune in treasure hoards, while others take up a life of adventure to escape from the law. Some have learned and perfected their skills with the explicit purpose of infiltrating ancient ruins and hidden crypts in search of treasure. As you create your rogue character, consider the character’s relationship to the law. Do you have a criminal past—or present? Are you on the run from the law or from an angry thieves’ guild master? Or did you leave your guild in search of bigger risks and bigger rewards? Is it greed that drives you in your adventures, or some other desire or ideal? What was the trigger that led you away from your previous life? Did a great con or heist gone terribly wrong cause you to reevaluate your career? Maybe you were lucky and a successful robbery gave you the coin you needed to escape the squalor of your life. Did wanderlust finally call you away from your home? Perhaps you suddenly found yourself cut off from your family or your mentor, and you had to find a new means of support. Or maybe you made a new friend—another member of your adventuring party—who showed you new possibilities for earning a living and employing your particular talents. You can make a rogue quickly by following these suggestions. First, Dexterity should be your highest ability score. Make Intelligence your next-highest if you want to excel at Investigation or plan to take up the Arcane Trickster archetype. Choose Charisma instead if you plan to emphasize deception and social interaction. Second, choose the charlatan background. At 3rd level, you choose an archetype that you emulate in the exercise of your rogue abilities: Thief, detailed at the end of the class description, or one from another source. Your archetype choice grants you features at 3rd level and then again at 9th, 13th, and 17th level. At 6th level, choose two more of your skill proficiencies, or one more of your skill proficiencies and your proficiency with thieves’ tools. Your proficiency bonus is doubled for any ability check you make that uses either of the chosen proficiencies. Beginning at 7th level, you can nimbly dodge out of the way of certain area effects, such as an ancient red dragon’s fiery breath or an ice storm spell. When you are subjected to an effect that allows you to make a Dexterity saving throw to take only half damage, you instead take no damage if you succeed on the saving throw, and only half damage if you fail. Scout is unbelievably versatile, indeed. Combined with Monk and Mobile alone, it's almost godly. Good luck trying to chase that guy down. Ah. Seems we've found Usain Bolt's class in D&D. Where is arcame Trickster roguish archetype here and especially on the character creator?! It’s not a part of the Basic Rules. You’ll need to purchase the PHB to unlock it. You have to purchase the players handbook on this website in order to be given information about it. This website displays and uses only the basic rules unless if you were to purchase a book from the website’s digital store. I own a physical copy of the PHB, any way to unlock it on here without making a separate purchase? Nope unfortunately im pretty sure you have to buy it online too. you can create a homebrew subclass and input the info that is in the book in there. However you will only the people in you campaign or yourself will be able to use it. What about assasins and swashbucklers? I purchased the PHB both digital and physical and I cant find it on digital. Can a Rogue use magic? Or is there like a Spellthief or a Spellblade? Yes the Arcane Trickster subclass. Some can as a racial trait. An elf like an Eladrin has an inherent ability of Misty Step from the word go as a Rogue and can gain a really nice feat of Snirvfbelin Magic in just a few higher levels if your DM allows feats as opposed to ability score increases. Can you post information for assassin?